Betsy McCall Fairy Tale Land Ad 1962 This is a nice color ad from McCall of New York with nice graphics from an August 1962 magazine. 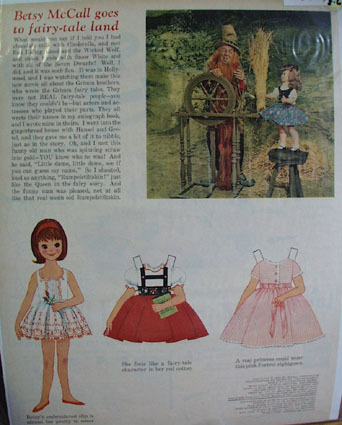 There is a short story about Betsy McCall visiting Fairy-Tale Land, including a picture of Betsy with Rumpelstiltskin.. Also has a 6"" Betsy McCall cut out doll with a cut out dress and night gown... In mint condition. Photo is taken through plastic and may show wrinkles or crookedness that is not in the ad. This magazine tear sheet measures 10"" wide by 13 1/2"" tall. Items Similar To "Betsy McCall Fairy Tale Land Ad 1962"